Sarah McQuaid is a singer, guitarist and writer. When Two Lovers Meet and I Won't Go Home 'Til Morning. 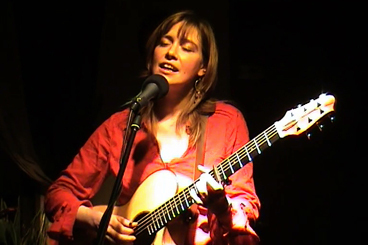 ...Renowned for her warm, engaging stage presence, Sarah McQuaid is a versatile and beguiling performer. In addition to her own elegantly crafted originals, she interprets traditional Irish and Appalachian folk songs, Elizabethan ballads, 1930s jazz numbers, surprise covers and lively guitar instrumentals with panache and poignance. Her deliciously earthy voice delivers a powerful emotional punch that’s matched by her distinctive, eloquent guitar style. Add this to a real rapport with her audience, and you have all the ingredients of a great night out. Born in Spain, raised in Chicago and holding dual Irish and American citizenship, Sarah spent 13 years in Ireland and now lives near Penzance, Cornwall, in the southwest of England. As might be expected of one who has led such a peripatetic existence, Sarah developed a taste for the road early on: From the age of twelve she was embarking on tours of the US and Canada with the Chicago Children’s Choir. At eighteen she went to France for a year to study philosophy at the University of Strasbourg, where her performance at a local folk club drew a rave review in the Dernières Nouvelles d’Alsace, saluting the “superbe chanteuse d’outre-Atlantique qui fit passer comme une vibration émotionnelle dans une salle conquise” (superb singer from across the Atlantic who caused an emotional vibration to pass through a conquered hall)! In 1994, Sarah moved to Ireland, where she became a weekly folk music columnist for the Evening Herald and a contributor to Hot Press magazine. She is also the author of The Irish DADGAD Guitar Book, described by The Irish Times as “a godsend to aspiring traditional guitarists,” and has presented workshops on the DADGAD tuning at festivals and venues around the globe. Her debut solo album, When Two Lovers Meet, featured traditional tunes and songs along with one original number. “Sarah’s voice is both as warm as a turf fire and as rich as matured cognac.... An astonishing debut by a unique talent,” wrote the Rough Guide To Irish Music. Despite the critical acclaim, a long break from the music scene followed, during which Sarah married Feargal Shiels and had two children, Eli and Lily Jane.